The Bourbon Orleans Hotel is an iconic New Orleans, Louisiana, hotel based in the heart of the vibrant and alluring French Quarter. Blending a long history and rich heritage with a vibrant present, this historic hotel has recently undergone a massive restoration to create an upscale haven for the modern traveler. 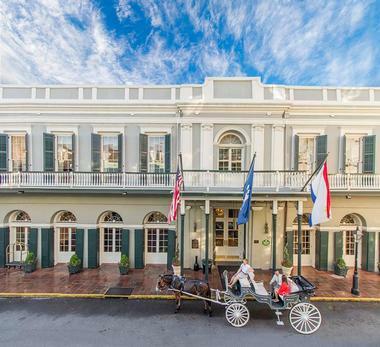 Located next to two great New Orleans landmarks, Jackson Square and the St. Louis Cathedral, Bourbon Orleans Hotel has it all from beautiful French Quarter accommodations, delectable Southern cuisine at the hotel’s Creole restaurant, Roux, and a sparkling outdoor heated swimming pool. Set just half a block away from the vibrant nightlife on Bourbon Street, plethora of restaurants, art galleries, antique shops and boutiques on Royal Street, and some magnificent French Quarter architecture, the Bourbon Orleans Hotel promises an unforgettable stay. The Bourbon Orleans Hotel features beautifully appointed and tastefully decorated guest rooms with plush pillow-top beds and luxurious linens, en-suite bathrooms with granite countertops, walk-in showers, plush towels, waffle cotton robes, and organic bath products, and spacious sitting areas with work desks and ergonomic chairs. Modern amenities in every room include individual climate control, 42” flat screen televisions, alarm clock radios with iPod/iPhone docking stations, in-room coolers, coffee makers, complimentary bottled artesian water, in-room safes, and complimentary wireless Internet. Guest rooms have private balconies which overlook Bourbon Street and boast picturesque French Quarter views. Charming and newly restored traditional guest rooms boast Provençe-style décor and spacious living areas, King, Queen or two double beds pillow-top beds and luxurious linens, and en-suite bathrooms with granite countertops, walk-in showers, plush towels, waffle cotton robes, and organic bath products. 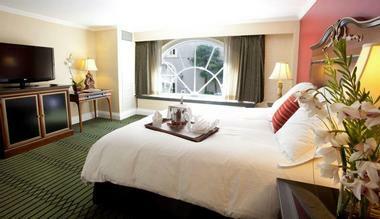 Traditional guest rooms have beautiful courtyard or French Quarter views and boast modern amenities. Vieux Carré guest rooms are spacious and bright with custom wide-blade plantation shutters and ample sitting areas, wet bars, and comfortable furnishings. Vieux Carré guest rooms include two queen-size beds or one king-size bed with luxurious linens, en-suite bathrooms with granite countertops, walk-in showers, plush towels, waffle cotton robes, and organic bath products. 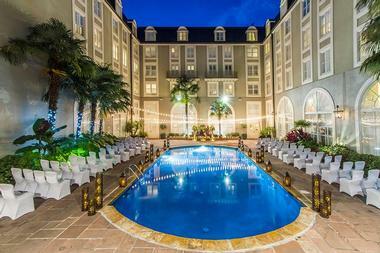 Vieux Carré guest rooms have beautiful courtyard or French Quarter views and modern amenities. 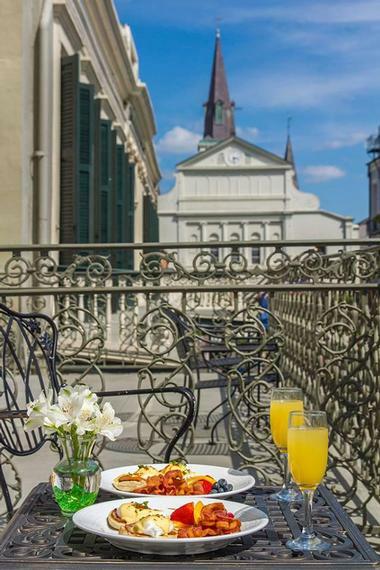 Blending New Orleans tradition and urban luxury, Petite Balcony Rooms have ornately filigreed private balconies with stunning views of the St. Louis Cathedral and the French Quarter. Petite Balcony Rooms have two double beds or one king-size bed with luxurious linens, en-suite bathrooms with granite countertops, walk-in showers, plush towels, waffle cotton robes, and organic bath products. Newly renovated French Quarter Suites are approximately 500 square feet in size and feature two floors with spacious living areas on the lower levels featuring comfortable seating and wet bars, and sleeping areas on the upper floors. French Quarter Loft Suites are spacious two-story suites with queen bedrooms and en-suite bathrooms with granite countertops, walk-in showers, plush towels, waffle cotton robes, and organic bath products on the upper level. The lower levels feature ample sitting areas, wet bars, and comfortable furnishings, as well as modern amenities. The open-plan, double-story St. Ann Balcony Loft Suites and Orleans Balcony Loft Suites are the signature suites of the Hotel and feature living rooms downstairs with ample sitting areas, wet bars, and comfortable furnishings. Queen-size bedrooms have en-suite bathrooms with granite countertops, walk-in showers, plush towels, waffle cotton robes, and organic bath products are located on the upper level. St. Ann Balcony Loft Suites have large private balconies with French doors overlooking St. Ann Street and have modern amenities throughout. Located on the third floor of the hotel, the Bourbon Balcony Loft Suites boast open-plan, double story floor plans with living rooms with wet bar downstairs and queen bedrooms and en-suite bathrooms on the upper levels. The Bourbon Balcony Loft Suites boast large private balconies with French doors overlooking Bourbon Street and feature modern amenities, including flat panel televisions, alarm clock radios with iPod/iPhone docking stations, in-room coolers, coffee makers, complimentary bottled artesian water, in-room safes, and complimentary wireless Internet. The Governor’s Suite is the most intimate and private French Quarter suite in the Hotel with marble floors and charming Provence-style décor and furnishings. 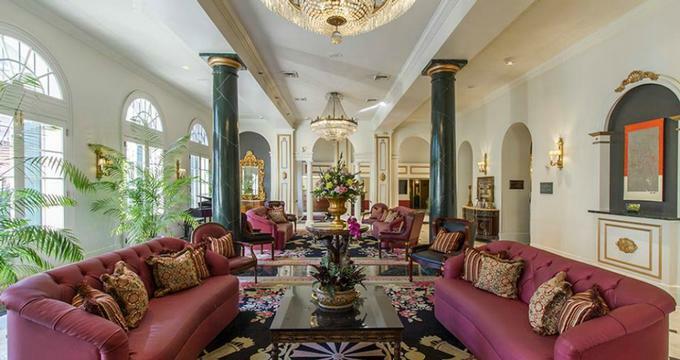 The Governor’s Suite offers a spacious living room and an elegant seating area and parlor with plush sofas, a dining table and chairs, a wet bar and refrigerator, and a king bedroom with pillow-top four poster bed and en-suite marble bathroom with a sunken Jacuzzi bathtub and walk-in shower. The Governor’s Suite has a private balcony with plantation shutters overlooking the lush greenery of the courtyard and the saltwater swimming pool. The Bourbon Orleans Hotel’s restaurant, Roux on Orleans, serves award-winning contemporary Creole cuisine using the freshest seasonal ingredients sourced from Louisiana. Amenities at the Bourbon Orleans Hotel include an outdoor heated swimming pool, a state-of-the-art fitness center, an award-winning Creole restaurant, and fully equipped meeting rooms with audiovisual equipment, and complimentary wireless Internet. Additional guest services include concierge services, valet parking, baggage storage, luggage assistance, laundry service, in-room dining, daily newspaper delivery, local calls, and daily wake-up calls. The Bourbon Orleans Hotel offers beautiful venues for special occasions like weddings, receptions, vow renewals, and anniversaries. The hotel boasts New Orleans’ oldest and grandest ballroom, which dates back to 1817 and can accommodate up to 350 guests. 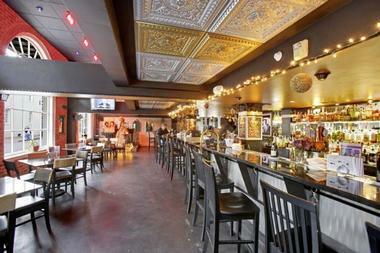 Other unique venues offered at the Bourbon Orleans Hotel include the beautiful St. Ann Cottage with cathedral ceilings and antique chandeliers that can accommodate weddings of up to 90 guests. The onsite Roux Restaurant offers Creole cuisine and can cater for up to 60 guests for bridal luncheons and rehearsal dinners, while the private courtyard at St. Ann Cottage can accommodate up to 75 guests. Additional event services include French Quarter event catering for up to 300 people reception-style, wedding ceremonies at the St. Louis Cathedral, a complimentary bridal suite on the evening of the marriage reception, a professional wedding coordinator, a complimentary bottle of champagne for bride and groom toast and cake cutting service, and more. Business meetings and conferences are catered for with a variety of flexible meeting rooms and spaces, which include state-of-the-art amenities, audiovisual equipment, banquet services, and wireless Internet connection. Cultural attractions in the city include The Presbytery, St. Louis Cathedral, the Old Ursuline Convent, The Historic New Orleans Collection, St. Louis Cemetery, Cabildo, and the National WWII Museum. Family-friendly activities include the Aquarium of the Americas, the Audubon Zoo, the Louisiana Children’s Museum, Story Land at New Orleans City Park, the Audubon Insectarium, and Mardi Gras World, while art-lovers will delight in the New Orleans Museum of Art, the Ogden Museum of Southern Art, and the Contemporary Arts Center.